Note to Mods: I have written permission from the author of this column to reprint it in its entirety. You may PM me if you would like a copy of the email. LAPD, as well as the sanitation Department, Parking Enforcement, General Services, the Health Department, Motorcycle Officers and a Helicopter raided Jamiel’s Law (a proposed City ordinance to deny “sanctuary city” protection to illegal alien gang members) Petition signing in Leimert Park, on Sunday, August 17. The Shaw’s were asked to show ID as well as provide Social Security numbers. Let’s make this perfectly clear: American citizens were denied the right to collect signatures to place an item on the ballot while Special Order 40 protects illegal alien gang bangers from being asked their immigration status. This is an outrage. How is this different from a Police State shutting down a legal public attempt to redress grievances? It isn’t. Call the Los Angeles Police Department (Southwest Division) and asked who sent them to harass the Shaw family. This kind of multi-department harassment had to come from the highest levels of Los Angeles Government. 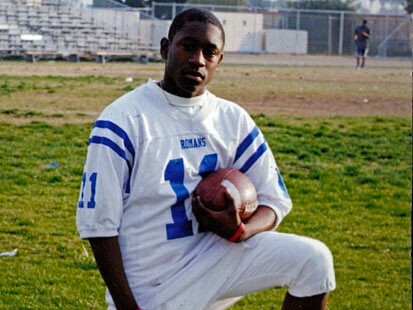 Every Sunday, The Shaw Family and supporters of Jamiel’s Law, come to Leimert Park from 11:00 a.m. to 5:00 p.m., to get signatures to put Jamiel’s Law on the March 3, 2009 ballot. We have our Jamiel’s Law T-shirts on and we have Jamiel’s Law petitions. We started doing this June 29th and we have been there every Sunday. We usually barbecue and give away free hot dogs, chips and sodas, as a way of saying, “Thank You”, to the people supporting us. But today, the family had a party for Thomas (the younger brother of murdered victim, Jamiel Shaw, II), at a different location, so we just had drinks and chips for the kids. Suddenly, the park was surrounded with Los Angeles Police Officers. Some in plain clothes and some in uniform. At least 7 or 8 black and white cars and a couple of police vans, if not more. They started with our family. Asking for identification and asking for our social security numbers. We showed our identification, but we refused to give our social security numbers to the Police Officer. The officer was not happy with this and said, “You know, I could give you a ticket for blocking the sidewalk”. We did have a table up against a fence, with plenty of room to walk. We told the officers, “We’re here to get signatures to put Jamiel’s Law on the March 3, 2009 ballot. We’ll move our table to the inside of the fence”. He said we couldn’t do that. His words were, “you can’t get signatures in a public park”. So we said, “we’ll talk to people as they walk by”. According to the same officer, “You can only get signatures going door to door”! One of the officers refused to give us his business card. However, another officer did hand us his card and he told us, “Many officers do support what you all are doing, but this is very political. ‘They’, are trying to shut you guys down. I hope you get the signatures you need”. A third officer told us this raid was planned a week ago. He said, “We’re just following orders, it’s not us”. Then the Health Department walks up and tells us that we cannot give away water, soda and chips without a permit. We had about 4, 6 packs of water and sodas and small bags of chips. They told us, “load it up”. Then the trash truck shows up ready to haul everything away. If that wasn’t enough, the helicopter comes and hovers over the area. You would think we were criminals. In addition to all of this, the City will not open the restrooms in the public park. It’s true! They lock us out. We’re forced to leave the park and go use the restrooms at one of the fast food restaurants. We have to fight and complain just to get the City to open the restrooms and we’re still being ignored. Yet the City Council members bend over backwards to approve a restroom facility for day laborers at Home Depot. We’re shocked by all of this! The first time they raided the park I wasn’t able to get pictures. I forgot the camera at home and forgot that I have a camera on my cell phone. Although I was able to get pictures after all, because did I mention two hours later they raided the park again?! I wonder how much did all of this cost the City of Angels? Mayor Sam's Sister City - Home of Los Angeles Politics: The City of Los Angeles Raid Community Park! If I still lived in L.A., I would be at Leimert Park every Sunday with the Shaw Family. L.A.P.D. is being run by the mini-Gestapo in the forms of Chief William Bratton and Mayor Antonio "We Clean Your Toliets!" Villareconquista. This is an outrage and L.A.'s AMERICAN citizens should be furious. If you are in the Los Angeles area and would like to put your activism where your keyboard is, send me a direct message and I'll give you more information. You can also visit Immigration Watchdog's site for details. Help support Americans standing up against sanctuary cities, Special Order 40, and the corrupt Los Angeles government. How many more of our children have to die? Well, don't know what to do about it now. Yes there is. There is one side, then the other side and then there is the TRUTH, something the Mexican illegals and their lovers seem to not understand. Yes, now are you playing the devil's advocate for the LA Police and their crackdown against citizens assembling to get signatures? I'm sure they need your help. Indeed it has. The rest of the country must take heed, or risk a similar fate. You think? You should have stated "I KNOW . . . ." Can you imagine what LA will look like in about 3 years? That video looks like something out of the twilight zone known as messyco. What makes me the saddest about this entire situation? The Californians that were sounding the alarm 20 years ago were silenced and the rest of our government turned a blind eye and death ear as if they were exaggerating the demise of Cali. Had our government heeded their warning, none of this would be occurring.